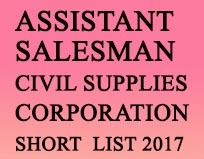 The following is the Probability List containing the Register Numbers of candidates who are found provisionally eligible to be included in the Ranked list, subject to the verification of the Original documents, for selection to the post of ASSISTANT SALESMAN - Wayanad (Category No. 222/2015 ) in KERALA STATE CIVIL SUPPLIES CORPORATION LTD on `4510-6230 on the basis of the Objective Type Test (OMR) held on 27/08/2016. The Register Numbers are arranged in their numerical sequence and the arrangement does not in any way, indicate their respective rank on the basis of the said test. The candidates whose numbers are included in short list are directed to be present for verification of original documents as per schedule published in notification. Note:- (1) Inclusion of Register Numbers in this list is purely provisional subject to scrutiny and admission of application on absolute basis. Inclusion of Register numbers in the probability list does not confer any right on the candidate for inclusion in the Ranked List. Note :- (3) The candidates who have secured 61.67 (Sixty one (point) six seven ) marks and above are included in the Main List of the probability list and the requisite marks have been lowered to the extent necessary in respect of the Supplementary list. Note:- (4) Candidates included in the Probability List should present and produce in person the original and self attested copies of documents for verification. Date, Time and Venue of certificate verification of candidates included in this probability list is published along with the Probability List. Note :- (6) Candidates belonging to Other Backward Classes included in this list who are required to produce Non – Creamy Layer Certificate as per G.O (P) No: 81/09/SC/ST/DD dated 26.09.2009 shall produce the same along with the other documents mentioned above at the time of verification of original documents.